I ran on the treadmill yesterday and realized I’ve been doing a lot of my runs on the treadmill lately. It’s weird but I definitely go in phases where I either want to do all my runs outdoors or all my runs on the treadmill. I’m on the tail end of this treadmill phase… I was definitely fantasizing about outdoor running last night! One lap into the last mile my phone battery died and I had to finish with no music!! Whaaaat. So hard. Right after my phone died and I was feeling a little bit sorry for myself (sore throat, no music) I remembered a story I read in the morning that inspired me. I think you’ll really like it too. 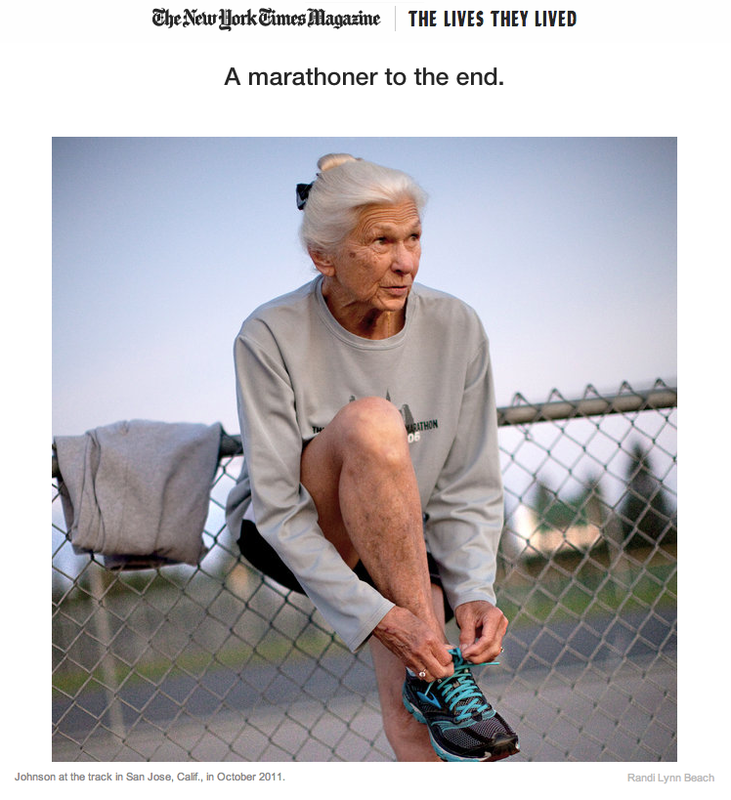 The NY Times did a story on Joy Johnson, who at the age of 86 completed the NYC Marathon for the 25th consecutive time. On Joy’s 80th birthday she started noticing her race times slowing down, so “she redoubled her efforts, boosting her training to include bleacher runs and hill repeats.” That year she shaved 51 minutes off her previous year’s time. I thought Joy was pretty amazing for finishing 25 marathons, but the fact that she shaved 51 minutes off her previous time at 80 years old is just outright amazing and inspirational. Which runners do you find inspirational? – Scott Jurek, Ann Trason, Anton Krupicka, Timothy Olsen and I always root for Kara and Shalane too! Do you ever dedicate your miles to anyone? – I’ve heard of people dedicating every mile of a race to someone and I love the idea. Previous Post Multiple 12-mile runs?! I have never dedicated miles to people, but I have definitely thought long and hard about people on runs. I don’t think I could ever really dedicate miles because I’m not a “deep thinker” when it comes to running. I usually daydream about fun things or I zone out. In the last few months I have been dedicating entire races to friends and family & it has really helped push me that much more in finishing strong. I think dedicating miles is a great idea. Hey Lisa! That’s awesome, I can definitely see how dedicating miles could be incredibly motivating. I’ve never dedicated miles. I’ve heard it really works, but (maybe this is selfish) I have trouble imagining that really focusing on someone else while in the middle of a long run/race would help me. It’s just not how my mind works! Yes, I totally get that. I can think about other people but not in a deep or serious way. I usually daydream about fun scenarios — the daydreams usually involve other people but I’m there too, haha.